DB2 provides functions to guarantee integrity at the system level and at the application level. From the system point of view, DB2's integration with zSeries and disk storage architecture is the cornerstone for data integrity. Logging functionality and COPY and RECOVER utilities are the building blocks for bringing the table space back to a current or consistent status in case of hardware or software failures or when application events need to be rerun. From the application point of view, DB2 supports locking and commit at the transaction level, and general data integrity (at entity and semantic level), and a set of referential constraint rules for each parent/dependent table relationship. The tables linked by referential integrity are recognized during the execution of the QUIESCE utility. Other logical relations across tables, necessary to support business rules, are implemented via constraints, triggers, user defined functions, and user defined tables. Informational constraints also exist, they are not enforced by the database manager, they are used to improve query performance. 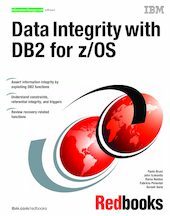 In this IBM Redbooks publication, we briefly describe the integration of DB2 for z/OS with System z architecture, we then explore the data integrity options and utilize the standard recovery functions for application-related issues.